Nehru had made it clear that despite being the prime minister of India, he would have not influenced the working of the national academy of letters. This was in 1955. Come 2017, and the current prime minister is too busy to interfere in the work of Sahitya Akademi. Moreover, he may not find the need do so; already there are many others in the government for this task. In the context of interference, let’s take a quick recap. In September last year, the Akademi invited media baron Subhash Chandra along with Hindi poet Ashok Chakradhar to its annual observation of Hindi Divas. They were asked to talk on the present status of Hindi language and the challenges ahead. While there can hardly be a debate over the credentials of Chakradhar – a Padma Shri awardee, the introduction of Chandra, a Rajya Sabha MP, as a ‘widely discussed scholar’ in the Akademi’s invitation card was met with raised eyebrows, irking several literature lovers and writers. The reason was obvious: Search engines suggest that Chandra has only one book to his credit, ‘The Z Factor: My Journey as the Wrong Man at the Right Time’, an autobiography, which puts him nowhere near the cream of India’s literary talent. But then again, this very function was held in collaboration with Zee Entertainment Enterprises; Chandra is a former chairman of Zee Media. Surprisingly, the Akademi president had been clueless about the plan to invite Chandra in the event, even when the news broke out to a coterie of literary figures prior to the function. The reporter, upon receiving the tip-off, contacted Vishwanath Prasad Tiwari, president of Sahitya Akademi, for his comments. Tiwari expressed ignorance about the event and the invitee; in fact, he even claimed of not being aware whether such collaboration with a corporate entity was even possible. Now going by Tiwari’s statements, if the highest decision-making official at the institution was unaware about major happenings of the event, it suggests that the decision then was taken by someone else, perhaps an outsider. Even under the UPA government in 2009, Samsung India instituted the Sahitya Akademi Tagore Literature Awards ceremony which later led to widespread protest demonstrations and sit-ins by writers and intellectuals. Similar is the situation in state Akademis. Recently, Sitanshu Yashaschandra, eminent Gujarati poet and playwright, withdrew from a Gujarat Sahitya Akademi function because bureaucrat Bhagyesh Jha was invited to deliver a lecture. “I failed to understand the credentials of Jha that enables him to speak on literature. What is more surprising is that Jha was appointed as the president of the Akademi which is against the constitution of our state Akademi. The president is always elected, not appointed. We, the writers’ community in Gujarat, are protesting this move by the state government,” says Sitanshu. In 2015, the institute was again in news and for all the wrong reasons. Nearly 25 writers returned their awards in protest of growing ‘intolerance’ in the country, against the backdrop of the Dadri incidence, and also due to the Akademi’s silence on frequent attacks on independence of writers, in particular reference to the murder of Kannada writer MM Kalburgi. Uday Prakash, Nayantara Sahgal, Ashok Vajpeyi, Krishna Sobti and Shashi Deshpande were among the first few to return their awards. Sahgal said that “India’s culture of diversity” and the “right to dissent” were under “vicious assault”. The boiling anger of the literary community was evident. Soon after, the resignation of former Akademi secretary K Satchidanandan from all committees came as a major setback to the literary circle. Meanwhile, the centre criticised this ‘award wapsi’, as termed in popular press. There were also the likes of writer Namwar Singh who supported the Akademi’s credentials as an autonomous body and denied any pressure from the government. While some like author KR Meera gave a nuanced view on the issue. During the turmoil, Meera had received the Akademi award. “At the time of the award, the country witnessed increasing attacks on the right to dissent and freedom of writers. My book that got selected questions the establishment. The reason that it got selected pulled me to receive the award. It was also apparent from the selection of my book that the jury was impartial,” says the Malayalam author. She, however, adds that the Akademi does need to distance itself from the government. Sreenivasarao, a ministry of culture official, denies any need to redesign the Akademi’s mandate. “Our constitution and mandate are well designed and well planned. The Akademi is, and will, remain a writers’ home, established and run by writers.” Though the Akademi maintains its autonomy – at least on paper – its strings seem to be in the hands of the government. Other than the restricted flow of ink, weak infrastructure and poor coordination among central and state Akademis are further signs of worry. On the ground floor of the Akademi, is a small library that is hard to find. The library is a couple of dozen feet away from the building entrance. I enter the library to the smell of old books. I strike up a conversation with a senior citizen, who is a regular at the library. He hands me a book of Urdu poet Faiz Ahmad Faiz. I flip its pages. The first whiff of grass sprinkled with evening dew, trailed by an undertone of vanilla in a musty breeze, emanates from the rust-coloured pages – enough to send any book lover into a dream world. 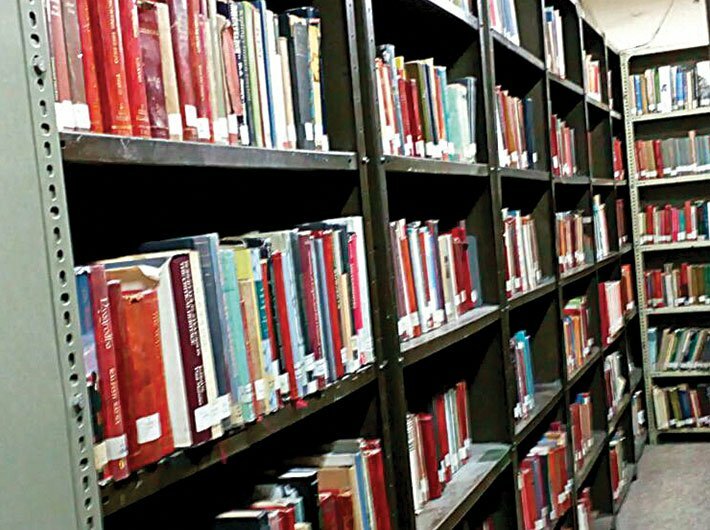 From old, lost translations to rare texts in vernacular languages, this library has over 2.5 lakh books in 24 languages. But the library, which enjoys the stature of a national library, chokes from limited space. Librarian Sufian Ahmad recalls conditions back in 2010. “A lot of books were lying unattended on the second floor of the building as there was space crunch and no cabinets to accommodate more books. We then introduced compactor storage racks to keep those books.” Even today, the library is not in a very good shape. Despite the fact that about 100 readers visit this library daily, there is no space to accommodate more than 50 people. Such is the space crisis that it is hard to find new releases or many of the bestsellers easily. According to insiders, the library now gets only half the number of books it used to 10 years ago. A few years ago, a high powered committee proposed setting up a library of culture – a common library for all three Akademis (including Lalit Kala Akademi and Sangeet Natak Akademi) – and in the meantime to find space for the existing library to expand. Ahmad says a place has been selected at Dwarka to shift some sections of the library. On an average, 150 books are issued daily from the library which has 13,500 members. Membership is open only to residents of Delhi-NCR. For those who want to read at the premises, there is consultant membership . Of late, the library has started digitising its content. “We have started with library catalogues. Soon we will upload soft copies of Sahitya Akademi publications,” says Ahmad. Though the Akademi and its library have presence on social media with live streaming and news updates, it has a long way to go in making its publications (over 7,000 titles in various Indian languages) widely and easily available; there is no mechanism to sell these books online. Apart from its headquarters in Delhi, there are only 10 state Akademis in the country. The rest of the states and UTs have their representation in the central Akademi based on the state government’s recommendations. This gives government officials primacy over eminent personalities from the literary world in making the representations. Sangeeta Srivastava, a Hindi scholar and writer based in Uttar Pradesh, remembers her struggle to invite speakers for her organisation which she runs to promote the writings of Rahul Sankrityayan, also known as the father of Hindi travel literature. “I don’t get a positive response from the Sahitya Akademi every time I ask for help. Writers in big cities don’t come here to deliver lectures. Moreover, there is no state Akademi in UP. Where to go and who to contact remains a problem,” she complains. The Akademi, however, in early 2016 after the award wapsi row, came up with an online directory to register authors. “If you have written at least two books in any language, you can register yourself in our online catalogue of writers,” says librarian Sufian Ahmad. This online directory is the fifth edition of the ‘Who’s Who of Indian Writers’ which was first published way back in 1961. “This revision of the edition was pending for long. This year, we decided to go online,” he adds. Your tenure as the Akademi president is going to end in 2017. How has been your time here? It was a good time. I got the opportunity and space to do whatever I wanted to do for the Akademi. My focus was on award ceremonies and literary programmes. What have you done to connect writers in small cities? This is one issue that the Akademi has been struggling with. I come from Gorakhpur and understand the need of writers from nondescript places. In last few years, our programmes have been decentralised. The Akademi conducted literary talks and reach-out programmes in cities like Haridwar, Dehradun, Muzaffarpur and Darbhanga. We did our best and will continue to do so in future. Was there any interference or pressure from the government? We are completely autonomous. What is important to understand is that the government gives us funds and thus we are answerable to them. There is no interference. Our executive body is completely an apolitical group of writers, which raises its voice in case writers’ rights or Akademi’s functioning is interfered with.